A blog for parents who like gardening, cooking, building, parenting, educating, fixing, and just about anything else. We love our current house, but we are still in the process of making it our home. As you may have read in one of my previous posts, the addition of kids really slows down the home project process. However, one of the biggest advantages of taking projects more slowly is the amount of time I can spend researching products before deciding what I want. This is my gift. This is my curse... All of that to say this: I hate my floors. Our carpets are so old and worn that we have stopped cleaning the stains. The tile is standard builder's grade beige with hints of beigeness, with beige grout. We have been fine with this for the past four years, but I say to these floors, "No more!" But back to the process part of the project. So before we tackled this project, we had to decide what to replace it with. We knew that we wanted something that was wood or wood-look, and we needed something relatively inexpensive (Remember, I'm an educator. We're famously underpaid.). So we had four contenders. Wood-look tile - This is ceramic tile that looks like wood. It looks super classy and is very durable. Engineered flooring - This is kind of like plywood. It is made from layers, giving it more flexibility in wet areas (kitchen, bathroom), with a thin layer of real wood on top. Laminate flooring - Laminate flooring is similar to engineered flooring, but instead of a layer of wood, a picture of wood/wood grain makes up the top layer. Laminate has come a long way in the past 15 years, with more realistic textures and pictures making up the flooring. Fifteen years ago I would not have considered laminate, but I have been impressed with some of the products out there, so I decided to include this in the mix. Solid wood - Solid wood flooring is made from...solid wood. While most solid wood floors are expensive, and some would say that they are not as environmentally friendly as other types of flooring, bamboo has become a popular choice due to its durability, speed of growth, and beauty. Not something that I think I can afford, but I will throw it into the mix for testing purposes. Because I am looking at doing this as a DIY project, and because I know that I will have to move methodically through the house (1700 square feet, including stairs), I decided that wood-look tile would need to be removed from the list. While I love its durability, especially with kids and dogs, I didn't think that the family would have patience for me to do the tile. Between pulling up floors, laying the tile, spreading the grout, cleaning up the grout, and sealing the grout, I didn't think that the timeline for doing this would work for us. Additionally, as a dad who often plays with his kids on the floor, tile tends to be a bit harder on the knees, back, head, etc., so we eliminated this option. I decided to put my kids to work. We picked up 11 flooring samples from three different stores to put them through the Renaissance Dad Flooring Trials of a Family of Five Test of Durability, or RDFTFFTD as my kids call it (not really). The flooring ranged in price from $.98 to $3.39 per square foot, with warranties ranging from 25 years to lifetime. Some of the flooring did not include an attached pad (like the $.98 sample), so the price would increase by about 40 cents per square foot to add a pad. But for the sake of the RDFTFFTD, we were merely looking at how the surface would hold up. In the red corner, our 11 selected samples, ready to face their challenge. And in the blue corner, weighing in at a combined 87 pounds, the Sisters of the Thunderdome! Safety glasses on, hammers loaded. They are ready for action. The first test was the pounding test, simulating kids dropping large, dull objects from many heights. Big A took on the challenge, holding the hammer at her shoulder and dropping it seven times on each sample. Dedication, and precision, all with a ponytail and a spitfire personality that will keep the flooring guessing what hit it. The next test was the claw test. Similar to the pounding test, the claw test used the claw of the hammer to simulate kids dropping sharper objects form a height, like metal winged planes, scissors, or the borrowed screwdriver from daddy (really, it must have been a kid that borrowed it...). Big E was ready to take on this challenge, again holding the hammer at shoulder height and letting the weight and gravity do its thing, three times per sample. She worked the samples like a boss, and they could hardly stand it. And then we busted out with the big guns. We wrapped things up with the "I'm going to claw you apart" test. Using a wallpaper scoring tool (used to score wallpaper for removal, which, parenthetically, is quite useless for this task) and 30 pounds of weight plates, we decided to simulate dog toenails, pebbles stuck in the bottoms of shoes, and a gem-studded sweater belly-slide across the floor. With 30 pounds of weight and teeth that only a mother could love, we did our thing, circling each sample five to seven times. The end result was what I expect many of these floors would look like after several years of wear and tear. 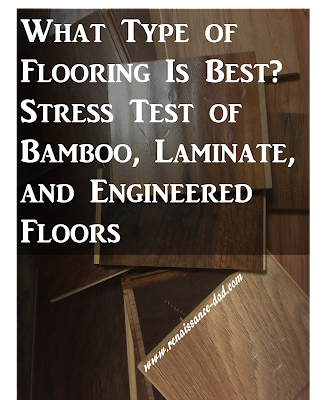 The 40 and 50-year flooring was trashed, and bamboo, laminate, and engineered alike were scratched, banged, and battered. And while the first glance led me to believe that a 50 year warranty would mean that the floor would look brand new for 50 years, reading the fine print showed me that a lot of the warranties were merely for structure, and those that were for the top layer typically did not cover major scratches. But before I cry, "Say it ain't so, Joe! There's no perfect floor? ", I reminded myself that a dropped pan on tile can and will crack the tile. Spills stain carpet, and even a finished concrete floor can get chips and dings. Stainless steel can get scratched and dinged, so until I can afford a solid layer of diamonds on the floor, I need to accept the fact that damage happens, but I can do things to lessen it. I apologize for all of the scrolling, but I wanted the pictures to be big enough so you could see how the floors handled the punishment. Ready for my top picks? I was extremely impressed, and pleasantly surprised, by two of the less expensive samples, both laminate floors with lifetime warranties ($1.49 from Costco, and $1.29 from Floor and Decor). The $1.89 from Lowes also looked pretty good. The laminates from Costco and Lowes both had an attached pad, while the laminate from Floor and Decor did not. However, looking closely at each one, the surfaces looked almost unmarred, which bodes well for this crew. So which one did we go with, or did we go with something completely different (surprise floor!?!)? You'll have to wait for the next post to see. 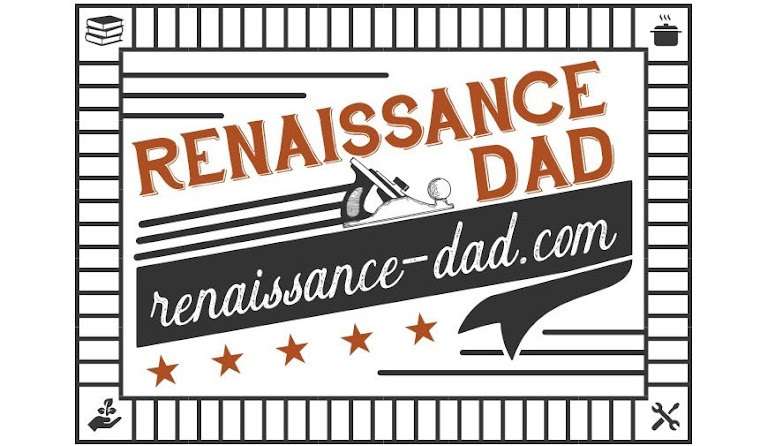 Or you can head over to the Renaissance Dad Facebook page to see the project already in progress. While you're there, be sure to like the page so you can see all of the Facebook exclusive Renaissance Dad updates. I had the privilege of being on Rosie on the House (my favorite radio program, in case you have missed it in a lot of my articles) for their Father's Day program. You can listen to the podcast here. You can like my Facebook page here. Because of their great customer service and fantastic results, Renaissance Dad is proud to recommend Above & Beyond Pool Remodeling for anybody in the Phoenix area. Read about our process here, and contact this great company here. I am a father of three with a wide variety of interests. I regularly have discussions with people in my community about education, gardening, parenting, or woodworking, and decided that it would be great to have a place to house those discussions. I am passionate about providing healthy opportunities for my family – from being outdoors to exercise to fresh, healthy food. Hopefully you will join me in these discussions as we look for opportunities to be people with healthy minds, bodies, and character.